I have a number of friends and family in the UK, most notably my sister, who have been asking me to give them a kimchi recipe despite there now being many great recipes available on the Internet. So, I have written up a recipe I use when in the UK where I can’t always get authentic ingredients and I need to make substitutions. 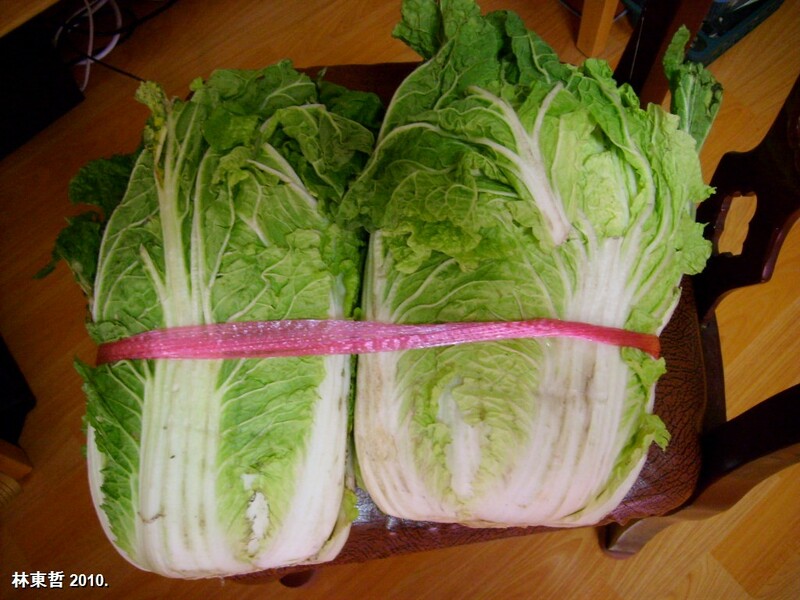 There are many different cabbage kimchi recipes encompassing different styles to regional variations. The fact kimchi is so varied makes it exciting and without doubt, everyone who makes kimchi does so slightly different from someone else. For Koreans, when mum makes kimchi, and I’ve only met a few men who can make it, their hands invest it with love. This is the recipe I use for what is basically a straight forward kimchi comprising the basic ingredients. Kimchi is very easy to make but it helps if you have some knowledge of how decent kimchi tastes so you are able to assess your endeavours and make adjustments to improve future attempts. Cabbage – Chinese leaf (called napa in the US). In the UK places like Tesco sell these but they are white, small and very stemmy. You will need 4 of these. Mooli – once again this sometimes appear in supermarkets though they are small, skinny and bendy. Turnips, 3 0r 4 make a suitable alternative. A whole bulb of garlic. Fish sauce – in the UK Thai Nam Pla is fine including ‘Squid’ brand. Salt, like a whole box or packet. You will need Kosher salt or sea salt and not table salt. Korean red pepper powder. You cannot substitute this but I have ordered it with easy in British Oriental supermarkets. A good size plastic tub – like a Tupperware tub. 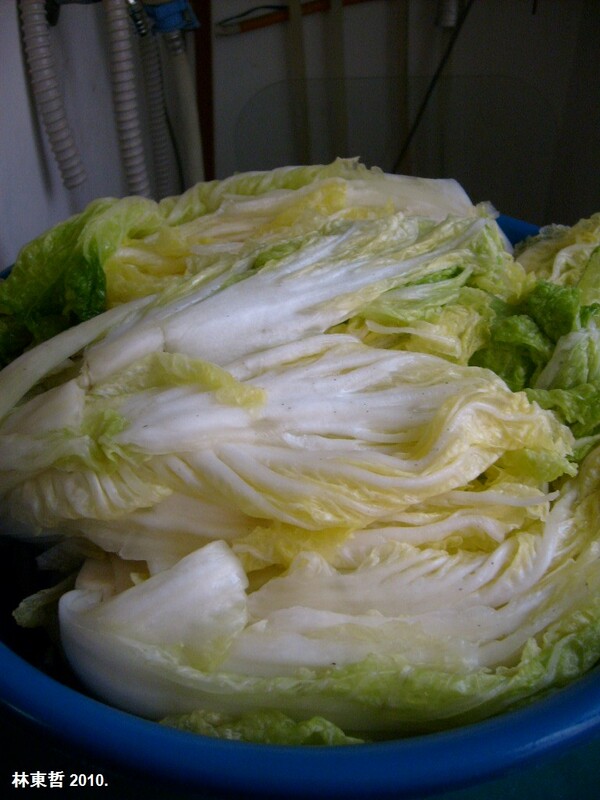 Without any doubt the most neglected part of recipes on kimchi involve salting, and hence wilting the cabbages. All my early failures at kimchi making resulted from recipes that failed to explain this process. Getting this right is crucial but it is very simple. 1. Immerse cabbages in water. Then trim off discoloured bases, remove any bad leaves, and using a good knife begin to cut the cabbage in half from the base. Once about a third of the way into the cabbage, remove the knife and then simply tear the cabbages in half. If you have large cabbages you would in fact quarter them in this manner but if they are the small ones I’d simply half them. Let the cabbages drain but don’t dry them. Double check your using sea salt! Lay the cabbage half on its back, and then begin sprinkling salt on the lowest leaf, on the inside. You’ll need to raise the rest of the cabbage up to access it and at times, with a small cabbage, you can hold it in the palm of your hand and finger the leaves apart. Make sure you sprinkle salt into the base area where stems are thickest. You don’t need lots of salt, just a good pinch for each leaf. This process is finicky with small cabbages. 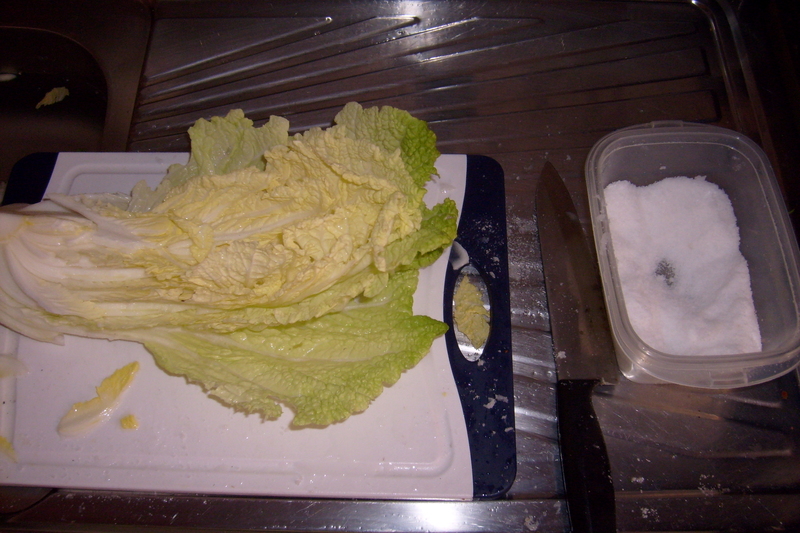 When all salted, put the cabbages in a bowl, throw a handful of salt over the top and then add a cup or two of water. Then simply leave them until wilted which may be between 2 hours to over night depending on the temperature. Turning them a few times during salting is useful. How do you know when the cabbages are ready to paste? First they will have reduced in volume considerably and the container will contain a lot more water. Most importantly, the cabbages should be limp and floppy j. A good test is to wring one and it should wring just like a cloth, without tearing. Next, rinse them 3 times. 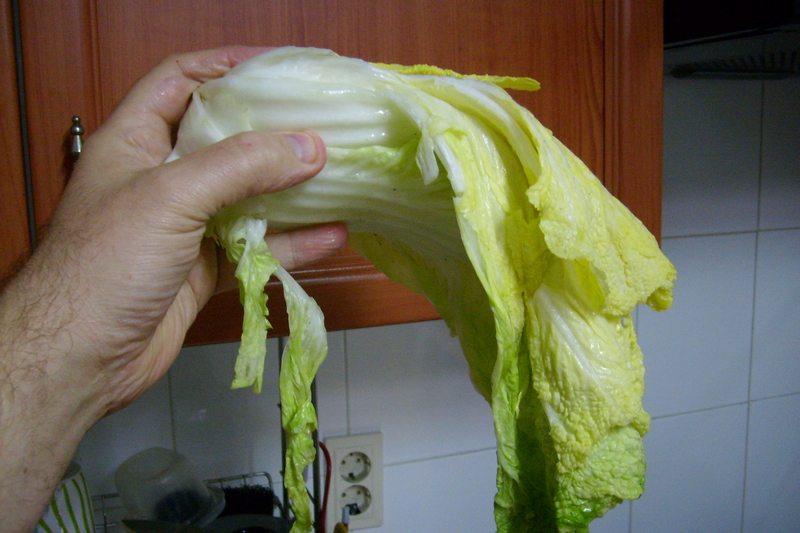 To prevent the kimchi being too salty, you can immerse cabbages in water and feel where excess salt is as it will have a slimy feel. Simply remove this with your fingers. Make sure you wash between the leaves. Finally, wring them to remove excess water which will otherwise dilute your paste. The cabbages are now ready to paste. Stage 2 Preparing the other ingredients. Mix 2 tablespoons of rice flour (or plain flour) in a little cold water, until it is a runny paste, then add this to a pan containing 1 and a half cups of water. Heat this until it begin to boil, stirring it constantly and adding any additional water until it resembles porridge. As it begins to boil you can add a 1 tablespoon of sugar but this is optional. 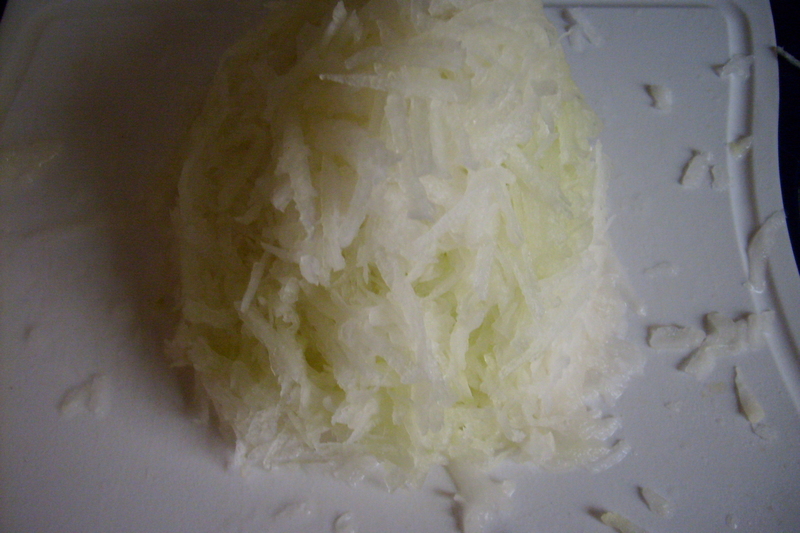 The ‘porridge’ provides some body to the paste and many Koreans do not use it. Personally, I quite like a thicker paste on kimchi though not too long after fermentation, the paste will have become diluted regardless. Mix them all together into a paste being careful not to burn your fingers on the porridge mix. This process is almost the same as salting the leaves; lay each cabbage on its back and staring with the inside lowest leaf, paste on the mixture. Any leftover paste I simply spread over the top unless there is a lot when I might freeze it for later use. Segments should be placed in a Tupperware container with each segment being laid in a head-tail-head order. They pack better this way. Where to store kimchi – basically, if it’s summer in the fridge and if winter, somewhere cold but not freezing. Kimchi ferments and as it does so the taste is altered. Part of the fun in making kimchi is in controlling the fermentation so you keep your batch in the condition in which you best enjoy it. 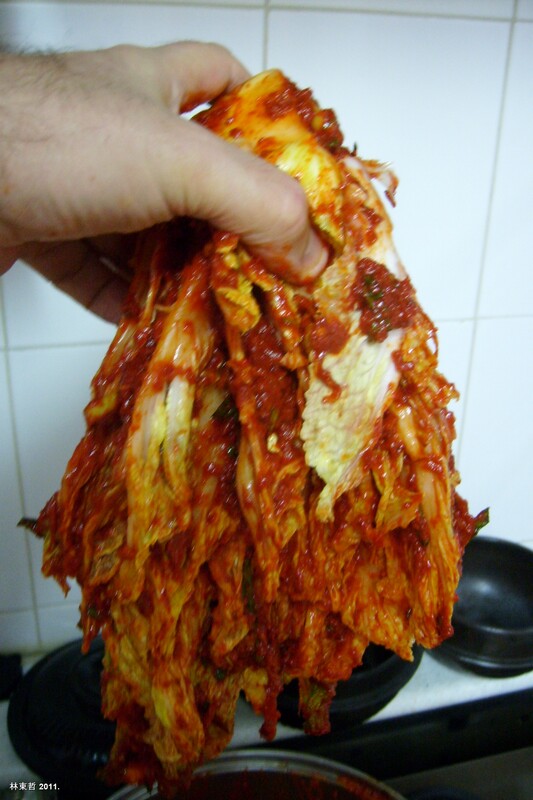 Fermenting kimchi – You can eat kimchi immediately. Prior and during fermentation, kimchi has a very fresh taste where individual ingredients are distinct. The kimchi will also be lively in colour. At this stage the kimchi can be salty but as fermentation and infusing continues, saltiness is lost. Some saltiness or even heat (spiciness) can be compensated with some additional sugar. If it has lost saltiness you can adjust this at this stage. Stems may still be slightly firm and thick stems may still have a little crunch left in them despite being wilted. Be prepared for some bad smells during this period. Fermentation can last up to a week depending on temperature and in comfortable room temperature (21 degrees) you can expect the lid of the Tupperware container to pop open about once every 24 hours. I’ve slept in the same room as fermenting kimchi and no longer find the aroma unpleasant but the released gasses will easily scent a room with what some will consider a very unpleasant smell. 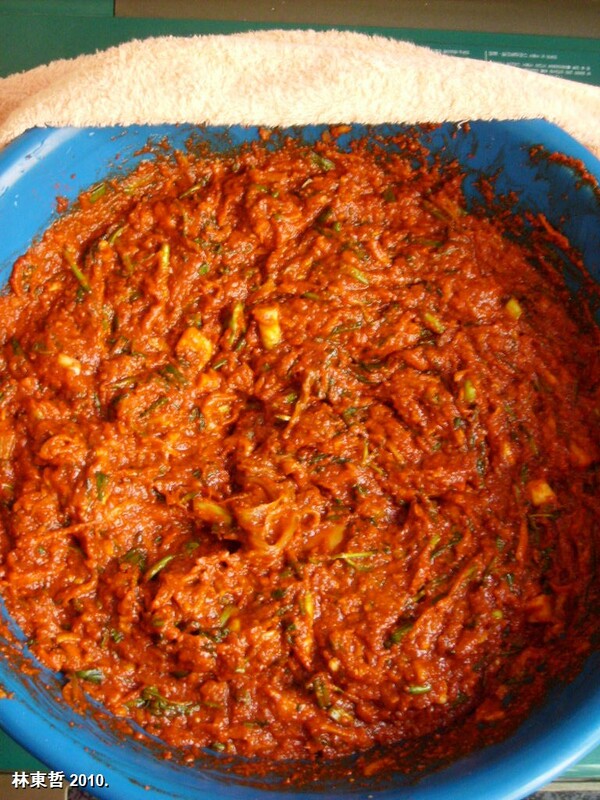 Fermented kimchi – individual flavours are much less distinguishable, saltiness is reduced and the paste has probably thinned and increased considerably. Don’t worry; this is delicious in stews and soups. I often make minor adjustment to saltiness and sweetness. 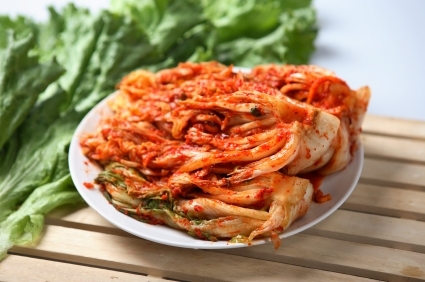 Aged Kimchi – aged kimchi draws your mouth with its sourness and if you appreciated this type of kimchi, there is a point, which differs for each ‘connoisseur,’ where the balance of saltiness, acidity, and sweetness combine to provide an exquisite taste. I often add a little sugar or salt to this kimchi in order to balance the mixture exactly as I like it however; it never produces the same sensation as it does when the balance is naturally right. Aged kimchi is slightly yellower in colour and the stems slightly translucent. 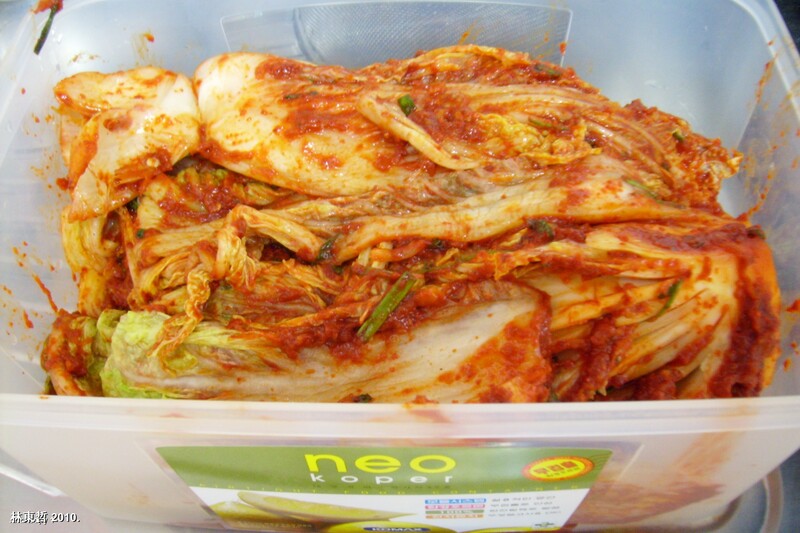 What aged kimchi might lack in lustre is compensated by its mature taste. Once you know how you like kimchi you can move your Tupperware pot in order to slow down or suspend fermentation. 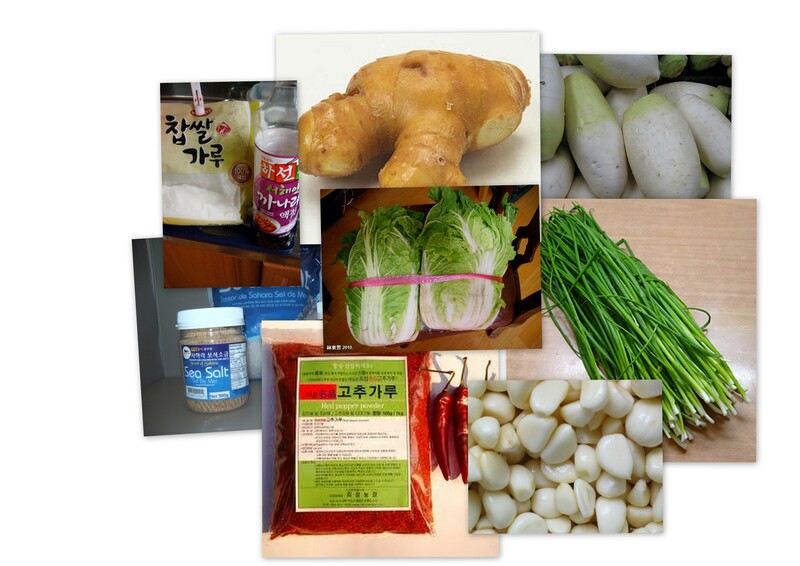 After the kimchi has stopped releasing gas, it will continue to mellow but at a much slower rate and during winter months or when it is kept in a cool place or the fridge, the taste will differ very little over several months. Very old kimchi, over six months might have mould on the surface but don’t throw it away; wash the mould of the top segments and the kimchi is still edible but much better for use in stews. If you can obtain minari, as you can in Korea, a bunch of this, chopped can be added along with the spring onion, garlic and ginger. Good luck and don’t be afraid to experiment as you gain experience! I have been behind on my blog-reading and I just made a batch unfortunately so I could not use this recipie, not the knew insight you gave me about the importance of the salting procedure (2011/02/01). I realized halfway through my latest batch, that I only had half as much coarse salt as I needed according to my cookbook. So I started wondering – “why do I add the salt, does the coarseness matter?” Turns out it probably does because I ended up using half course salt and half powder-salt (in grams) and it just didn’t give the same spungyiness as I seem to recall from last time (and you also describe). It is interesting that you say that I would not have to cover with water? I thought that the process would be a osmoses moving water out of the vegetables cell. But then you need a salt-saturated water medium. Is there an alternative explanation? If you know anything about the chemistry of this very interesting foodstuff – doesn’t matter if it is in molecular gastronomy-terms or just laymen’s terms – I would love reading about it! Johan, I have no idea about the chemistry involved in the fermentation process. I too thought it odd not to need to cover the cabbage with water. In the past I’ve used massive amounts of table salt in a bowl of water and even after 2 days the cabbage wasn’t right. So far, I’ve found something like sea salt, though I believe kosher salt is also good, and simply sprinkled it in between the leaves and then added a cup or two of water on the top. I’m sure however, I’m still using too much salt. By the way, one of my initial problems was saltiness. Good luck. Great idea to adapt the recipe for Britain! thank you I will try it and hope for the best. I’ll try to use pink Himalayan salt…here in Romania 😉 ….wish me luck in preparation this special food. I use about one cupful batch.